√ Are you tired of doing jobs you hate? √ Are you sick of not auditioning enough? √ Are you wanting to earn enough money as an actor so that you don’t have to have other jobs? √ Do you want more casting directors and directors to want to see you for roles? √ Do you dread when it’s time to pay your rent? If you answered YES to any or all of the above, then I am so glad you stopped by. Being able to answer NO to these questions isn’t magic. It’s something everyone can do. You have the opportunity to change everything, and to live the acting life you’ve always dreamed of living. Did I ever tell you about the time I was working in a coffee shop (in my 30’s)? Yep. Been there, done that. And then I was in my 30’s doing it ALL OVER AGAIN? I needed an income, and acting wasn’t providing me with enough money to live off solo. So I found myself looking for other work, and when I couldn’t get a desk job, I had to hit the local coffee shop and ask them for work. I couldn’t believe it. I especially remember this one day when this woman came in on a Sunday morning and approached the counter. She looked all fancy and full of money. She ordered her bacon and eggs deluxe breakfast and then proceeded to say “And can I get the bacon extra crispy please.” And she flashed her killer smile as she shimmied off to find a table with her perfect husband. I looked at that woman and I knew I wanted her life, for realzzz…I wanted to come in on a Sunday chilling with my partner, enjoying a warm breakfast, cup of coffee in hand, and giggling about the fabulous dinner party we had thrown the night before. I didn’t want to worry if my card would decline as I ordered my takeaway coffee on the way to all my crappy other day jobs. Working at that cafe definitely showed me what I didn’t have and it was back breaking work, serving customers day in, day out, hoping that I wouldn’t have to mop the floors at close time (which of course I would have to!). But it didn’t stop there. I also had a temp job where I would rock up every morning to see if they would place me that day for a role. Even if I wasn’t required, I had to go to the effort of turning up there in peak hour (I paid for transport), suited and booted, and wait to see if any companies had a short fall of office staff. On my birthday, I arrived at 8am at said company to see if I was going to be temping for the day. Turns out I wasn’t. 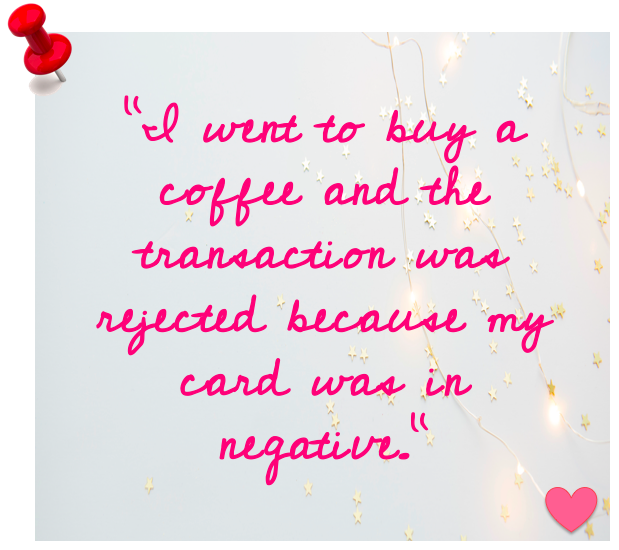 Afterwards, I left and went off to buy a coffee and the transaction was rejected because my card was in negative. I couldn’t even buy myself an espresso. On my birthday! I burst into tears and called my mum, a sobbing wreck. Needless to say, it was a low point. I hardly ever tell anyone about that story because I’m so embarrassed that it happened. At the time I felt stupid that I wanted to pursue a career in acting, when I couldn’t even get a temp job for a day. I felt stupid that I wasn’t booking auditions, and when I did, they didn’t call me back. It all felt fake. The whole lot of this shiny, bright, bullsh*t career. Eventually, it all came to a grinding halt. I decided I wanted more. I was going to work in the acting industry full time. I was going to change things. I needed to be more structured. I needed to get real and authentic about what truly mattered to me. I needed to let go of the crap mindset habits that were holding me back. I used my 10+ years of business experience from my previous corporate career and applied it. I systematically put steps into place to teach myself how I would do things differently. I wrote down ALL my goals…every last one of them. Essentially I had made a plan. A serious plan. A plan I believed in. And it became a planner, one that I could systematically work through to get myself out of my rut. Well I’m so glad you asked. Now I’m a full time working actor. I use the same planner that I did then to this very day. I have developed a way of working towards my dreams, one step at a time. And it works. Way back then when I was working in a cafe I never honestly felt like I was ever going to get out of that life. I felt like I was so stuck. And now? Now I wake up and do what I love every single day. That can be you! All you need is a little hand in showing you how you go about it. Someone to guide you through your personal pain points so you don’t keep hitting the same blocks over and over and over again. Because trust me, that’s what we often do as humans. But we don’t need to. There are other ways. You can have it all. Begin Acting. Be Everything. It’s the whole ethos behind my acting and mentoring business. I help actors to Begin Acting and to Be Everything they imaged that they could be. Plus some. I built my whole brand around this belief. 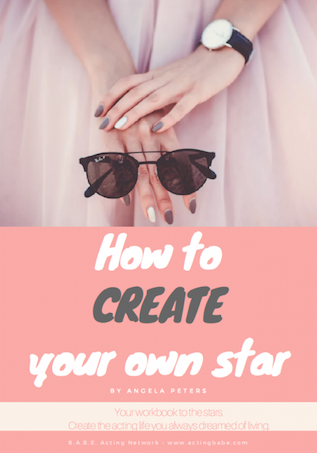 I truly believe that you can create your own star and live a life of acting bliss. And now it’s my honour to be able to help you do it. 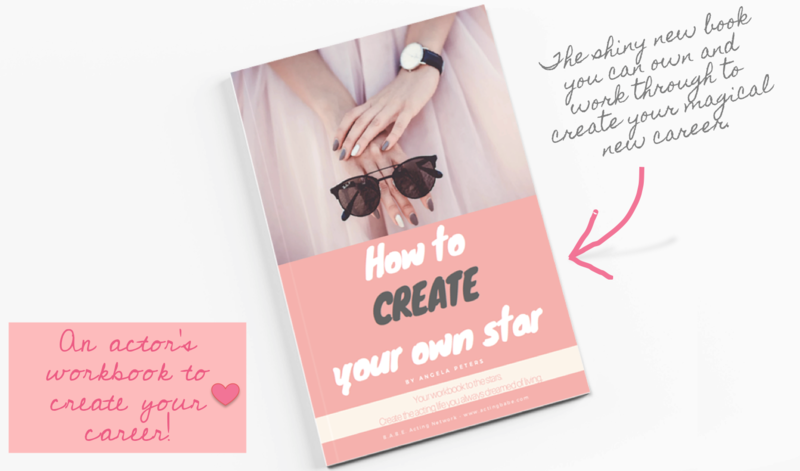 I would love to introduce you to the CREATE acting planner and workbook. You can order your copy right now by clicking here on Amazon. This planner takes all of my experience…and 20+ years of working with clients….and gives you powerful tools to systematically work towards your acting transformation, step by step. Wouldn’t you love to take the guesswork out of becoming a full time working actor?! Of course you would! Let your acting transformation begin. Let’s take a little peek into the CREATE planner and what it will do for you. Celebrates your current successes. Working through a series of exercises designed to flesh out your past wins and map out what you’re great at, you’ll identify in plain sight just how much you’ve already achieved and what you’re brilliant at. It will give you the confidence to move forward…and to keep dreaming of those big goals! Explores areas for development in your own life. You get a chance to tackle your biggest acting challenges head on and make realistic plans for ways to avoid this happening again. This chapter alone creates powerful shifts in an actor’s psyche. Here we go deep. It is time to delve into your first thoughts and feelings behind your love of and interest in a career in acting. After all, you need to understand why you love it, and where that love came from in the first place. From here you start to examine exactly what you want – be that financially, work-wise, and even how big you want your social media following to be. This is your dramatic climax, where you pen down all your passions and dreams into actionable quantifiable goals. It’s the getting-down-to-business part of your journey; the nuts and bolts of your success planning for the career you’ve been dreaming of. You create quantifiable plans using strategies that have proven to work for me and and for my mentee’s time and time again. Crosses into the relationship elements of your acting career – what is your relationship to others? Let’s talk through who can become part of your entourage, to help you in your journey to making your exciting new dream goals become your reality. Here you’ll get ideas on exactly why these other acting people are so important on your journey to complete acting freedom. Discover how the modern world of positive psychology and wellbeing is all encompassing and how it can work for you. It is just as important as letter writing and goal planning. You are given a chance to explore ways to create new excellent daily habits that will be life affirming, and good for you, the actor. A celebration of all you have achieved by working through CREATE, and quite literally creating a new plans for a successful acting career. This is the first phase before you go out and make it happen (by the Finale, it will have already started I’m sure). And remember, you can come back this book each and every time you need to reinvigorate your career, or change tact. Hi, I’m Angela. I am an experienced and accomplished actor who been helping actors and mentoring actors for over a decade, as well as working in the industry myself (so I know how it all really works). As an expert writer for Backstage, having published works in Casting Networks, The Stage, and various other acting blogs and publications, as well as a highly read and publicised award-winning blog for actors, I’m considered an authority in the business of acting, and creating positivity in your career. I’ve worked on huge movie sets, I’ve been cast as a hero on numerous international commercials, worked on stage, been in cinema released movies and can even be seen on Amazon from time to time, as well as voicing huge commercials and brands. A psychology degree under my belt too, along with years of acting experience, as well as mentoring actors and business professionals, has given me a unique insight into how people best change their habits, and improve their performance. It all happens using practical business skills along with some magical transformative thought processes. And let’s face it, business skills are what most actors lack. Let me help you! I am passionate about helping you have the career you always imagined. I truly believe hand-on-my-heart that there is enough space in the industry for anyone who wants to do it. You just need a willingness to work hard, and to follow your heart and your goals in equal proportions! Making CREATE has been an absolute dream for me because now I have a way to help thousands of actors around the globe to work on their careers with more structure and less guesswork. And because it’s in book form, it means you can return to your planner time and time again to get that success surge anytime you need it. This is the exciting part where we tell you all about the adventure you are on CREATing your new acting life and freedom. ♥ Firstly, you place your order for the book. You can do this by clicking on the Amazon button below. ♥ When is CREATE available? It’s available right now around the globe. Click here to buy it. ♥ Why should I buy it now and not just wait? Well that is a great question and we are so glad you asked. You wouldn’t wait for a “big break” if someone offered it tomorrow would you? So why would you wait to start making your acting life even better? Right…right! You care about investing in your acting career so much that you’ve clicked over here and read thus far. You want more out of your acting, and we want to help you. And we want to reward you for being so dedicated and wanting to get started on this journey as quickly as you can. We want to inspire you to do more, be more, and create more for yourself. ♥ When will we deliver it to you? If we were delivering the book ourselves, we would probably use one of our acting elves to get it to your chimney within a few hours. But sadly, since we rely on Amazon to deliver it, you will have to let them tell you when it’s due. Most of our customers get it in less than a week typically (some get really speedy deliveries)! We will be updating these FAQs as we go…so there’ll be more answers here in good time. ♥ How long will it take for my book to arrive? We let the amazing publishers work their magic and they’ll let you know by email when it is being shipped. ♥ Can I change my mind? Only as far as the Amazon policy allows (we aren’t in charge of this!). ♥ What if I don’t have an Amazon account? We are only offering CREATE via Amazon at the moment – sorry it’s our first time. But don’t worry – it will be offered via other channels soon. If you would like to be kept up to speed one when this happens, drop us an email. If you aren’t sure if you can get it in your country, drop us an email and we can find out – or attempt to arrange a special delivery just for you. ♥ What if I don’t agree with it? If you send us the workbook completely filled out as if you really tried hard to answer every question like one should, and you’re not happy with the result within 30 days of buying it (and fully completing it), then we will gladly give you your money back. We know that it works, so we encourage everyone to fill it out in full and put their best foot forward first, before giving up. Email us and we can tell you how to do this. You’ll need to include proof of purchase too when you send it back to us. ARE YOU READY TO CREATE THE ACTING CAREER YOU’VE ALWAYS DREAMED OF HAVING? I am so excited to help you. Simply click below to order CREATE. And you can stay in contact on the private B.A.B.E. Facebook group and chat with fellow actors as you continue on your journey to acting bliss. Click below to get started! Amazon. Want to join our private Facebook group? Email us and include your order through Amazon, the email address you used, and proof of purchase. You will then become part of the awesome and exclusive B.A.B.E.’s who are going to share in their acting transformations through the private Facebook group. Of course you totally don’t have to do this – we just get excited when people tell us they’re making transformational career changes. Contact for Angela at B.A.B.E.